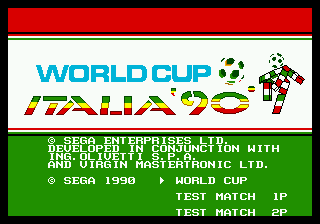 World Cup Italia '90 © 1990 Sega Enterprises, Limited. World Cup Italia '90 for Mega Drive was released in 1990 (exact date unknown) in Europe. It was then released in 1995 in Australia, bundled together with "Combat Cars". This game is known in Japan as "World Cup Soccer [Model G-4009]", in North America as "World Championship Soccer", and in Brazil as "Super Futebol". [EU] Sega Mega Drive (1992) "Mega Games I"
[EU] Sega Mega Drive (1995) "Mega Games 6 Vol. 1"
[EU] Sega Mega Drive (1995) "Mega Games 6 Vol. 2"
[EU] Sega Mega Drive (1995) "Mega Games 6 Vol. 3"